Are you one of those females who are constantly critical about your body weight and image? If yes, then you stand the risk to land serious health concern like, anxiety, depression, weight fluctuation and eating disorders. 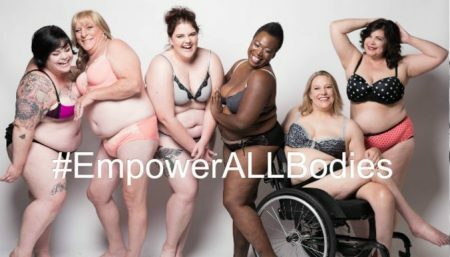 To begin with feeling positive, love your unique body which emphasizes self-love and acceptance of genetic diversity in body size. Body positivity doesn’t happen overnight, but with enough practice, anyone can completely switch attitude about their body. Becoming body positive starts with simply accepting your body first. Over time, self-acceptance leads to self-love and body positivity begins to feel more like a natural state of mind. There are plethora of researches correlating dieting and societal pressures to look a certain way with the development of restrictive and/or disordered eating patterns. It seems pretty clear-cut: diets are inherently anti-body positive. Encouragement self-affirmation in the pursuit of individual wellness. Everyone has the right to attain this in her own way. Why create artificial divisions? Ultimately, it comes down to mindset and intention. To do away with a singular focus on appearance and lead a full and healthy life which is a result of so much more than how we look. Realisation that you are worthy enough of finding your own unique path to physical and mental wellness, and there should be no judgments surrounding this. Don’t listen to body-shaming from others or from yourself. Surround yourself with friends and loved ones who promote body positivity. Practice body appreciation on a daily basis. Wear clothes that are comfortable and that make you feel good about your body. Work with your body, not against it. Rock that bikini on beach day! Reach Out: Use the time and energy that you might have spent worrying about food, calories, and your weight to do something to help others. Sometimes reaching out to other people can help you feel better about yourself and can make a positive change in our world. According To National Eating Disorder Association (NEDA) It’s time to take action and fight for a change. It’s time to shatter the stigma and increase access to care. It’s Time to Talk About being proud of your body, for there is no one like YOU!